1. Since Flo takes time to go up and down the lift, combine activities for guests staying on the same floor. 2. It is critical to earn maximum chain bonuses. Easiest options are putting gift baskets in empty rooms, checking in multiple guests at one time and then giving them their cases, and collecting & depositing waste laundry after rooms have been vacated. 3. Actions can be queued, which helps plan Flo's movements. 4. On the downside, actions cannot be unqueued, and that wastes time / prevents course correction in case many actions are in queue. The queue will end once all tasks are done / some task cannot be done. 5. Flo stops and shakes her head in case there is a cued task that she cannot do, so check often that she hasn't stopped moving somewhere while queued tasks are executed. 6. Clowns make messes in the hallways - guests stop when they come to a mess, so clean up ASAP. 7. From Stark Suites onwards, once celebrities are introduced, it becomes most important to service them fast, since their bodyguards hold up other guests until their orders are completed. 8. Anticipate behaviour patterns to get 'faster service' bonuses; for example, the businesswomen and joggers always ask for towels after meals; the newlyweds, teenaged boys and celebrities ask for pillows after meals; celebrities and fat men order food twice. 9. Picking up laundry bags does not break chain bonuses for activities like serving meals or checking guests out. So try to keep rooms vacant by clearing laundry quickly. This will help serve incoming guests quicker. But note: depositing the laundry in the washer will break the chain. 10. If the hotel is closed, focus on serving the guests rather than cleaning the empty rooms. 11. Remember, throwing away items costs money, so try not to do that often - or at all. If Flo has something in her hand / cart that can be carried around without slowing down service, keep carrying it. 1. If a group is particularly annoyed, focus on earning their hearts back with consecutive 'fast services' for them. 2. Gift baskets should be added to empty rooms to earn more happiness (and tips) from the guests when they arrive. 3. From the Alpine Ski Lodge onwards, opt for the musician - he is good for soothing irate customers, though Flo must wait near him while he activates. But this time is worth spending as ALL waiting guests get more hearts once he plays. 4. Guests must already be in rooms to be placated by iced water. 5. The iced water dispenser has limited usage given that it is usually inconveniently located and cannot be served to guests waiting to be checked in, which is where the maximum delay happens. Upgrade to it after ALL other upgrades are through. 6. Dogs bark and irritate neighbouring guests. They have to be fed dogfood, kept on the table with the room service. 7. The sneaky woman switches the lights off only once per level. 8. Stark Suites, with its celebrities, businesswomen and businessmen is the most chaotic, with demanding and impatient customers all around. 9. The hotels lose $100 for every customer lost. 10. Don't panic! Even with the loss of a customer or two, there are still enough customers to achieve Expert easily enough on all levels. 1. Buy upgrades that add tips first - such as art, wallpaper and carpets - when there are fewer guests so less chance of them getting annoyed. 2. Buy patience-generating upgrades towards the later levels when the crowd builds up. 3. Flo's upgrades are expensive and need to be planned well - for example, she doesn't need to be very fast for the starting levels and hence at those times, the cheaper and more rewarding hotel upgrades should be done. The elevator, cart, mop and shoes upgrades need to be done in that order. 4. Guests who stay in 'star' rooms pay 'star bills' - currency used to fix up the special room. The more star bills, the more likely Flo is to furnish all available items for the room and earn the special bonus - so it pays to star up the rooms of the hotel as early as possible. 5. Add stars to the larger rooms first to maximise tips. Each star costs $750, so try and add at least one stars to each room at every level. 6. Even two stars on each room gives enough star bills to complete the VIP rooms within the 8th levels of each hotel. 1. The socialite with the multiple suitcases takes some getting used to - click the number of times as the suitcases to pick all up in the cart. 2. From the Alpine Ski Resort onwards, some guests also want a wake-up call - which can be a knock on the door or a call from the reception desk if Flo purchases the telephone upgrade. 3. Retrying a level for the first time adds the cash earned in the level originally to the bank. This is an original Tips & Tricks written by me. Please do not distribute / adapt the text and images in any way without my written consent. game brief: When Quinn’s new travel business hits a snag, she needs Flo’s patented elbow grease to help renovate and run hotels all over DinerTown! 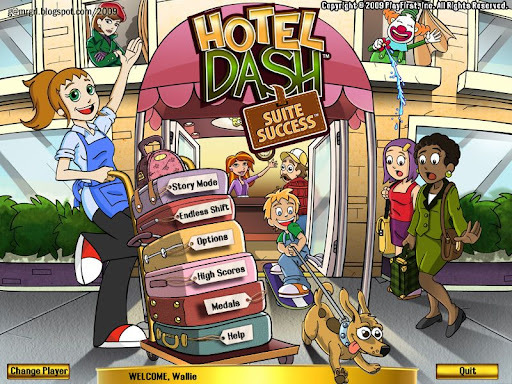 Experience a Hotel Dash as you deliver guests' luggage, drop off room service and provide extra towels and blankets! Use your tips to decorate and restore each hotel back to its original charm in this fast-paced Time Management game! review: Dash Heroine Flo returns, this time to help pal Quinn iron out the bumps in her fledgling travel planning business, in the aptly-titled Hotel Dash: Suite Success. Quinn hits her first roadblock when she extends her services from travel booking to honeymoon planning for newlyweds Tony and Vicky. The couple wants to remain in town to be close to Tony's business, and Quinn books them into Dinertown Suites, little knowing that the place has gone to seed over the years. With only 10 days to go before the couple arrives, Quinn turns to Flo for help to restore - and exceed - Dinertown Suites' old glory, and to make Tony and Vicky's honeymoon a success. ...and so are Quinn and Flo, to move on to their next challenge, the Stark Executive Suites in the city. Pal Cassie needs to wow visiting investors - starting with their accommodation. The city is full of demanding clients: businesswomen, celebrities and socialites, which makes Stark the most challenging of the hotels restored by the duo. With Stark converted into a buzzing business hub, Quinn and Flo change gears to rebuild holiday hotel Tiki Palace in time for Darla's parents' tropical getaway. Tiki moves along at a relaxed place, with generally patient tourists as its primary guests. Which brings the dedicated duo to the final hotel on the makeover list, the crumbling, haunted gothic marvel Dunwich House! A truly spooky atmosphere and terrific theme music - not the mention the real ghosts it has as guests - make Dunwich the most interesting restoration project. The game stays staunchly loyal to the Dash Family Values in terms of design, artwork and game-play. It starts with a quick tutorial, introducing core items and taking gamers through basic tasks. It's good enough to get going, and the rest is easily picked up once the game is afoot. The concept is straightforward: guests arrive at the hotel and must be checked in, then provided with their luggage, room service, and sundry items like towels, pillows and kibble for their pets. Once the guests eat, hit the pool and/or the gym, and take a nap, Flo needs to check them out and put the laundry for cleaning. In between, she mops up spilled water and broken flower vases, dispels hauntings by naughty ghosts, clicks photos for the tourists, wakes up oversleeping and/or sleepwalking guests, puts welcome gift baskets in empty rooms, and investigates a girl in a green trenchcoat who appears to be sabotaging the hotels. The guests look and act the same as earlier Dash patrons - cheerful girls, honeymooning couples, camera-crazy tourists, impatient businesswomen, clumsy clowns, annoying teenagers, sultry socialites loaded with luggage, celebrities with aggressive bodyguards, men with dogs, and men with beer guts. However, they are all noticeably calmer than they've been in past games, and the situation never really gets overwhelming. Guest losses due to irritation are few, and limited largely to the businesswomen, who are - understandibly - the crankiest. As usual, the guests are coloured either blue, green, yellow or red, as are the rooms, and there are bonuses for matching the guest colour repeatedly to the room colour. Points are also earned for chaining activities and fast service. Customer hearts lost due to room allotment / service delays can be won back with quick service, a chilled glass of water, or, for those waiting in the lobby, some live music from the resident musician. 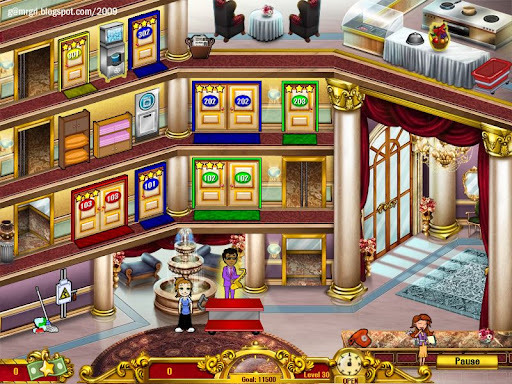 Various upgrades can be purchased with the profits to make the hotel more attractive (wallpapers, carpets, flooring, plants, artwork), improve services (reception phone, faster mops, quick filling water dispensers, more active musicians), and boost Flo's speed (quick shoes, larger carts, faster elevators). The upgrades are reasonably priced and can usually be acquired by the 5 - 6th levels of each hotel, making the later levels significantly easier. Another upgrade is the addition of stars to the rooms - upto a maximum of 3 stars each. Guests staying in star rooms are happier and pay star bills, besides room rents and tips. These star bills are used to refurbish the themed VIP Suite of the hotel that is reserved for special guests. Decorations include deluxe flooring, wallpapers, rugs, curtains, candlestands and chandeliers, designer beds, desks and chairs, and even a waterfall! Click to view The Honeymoon Special @ Dinertown / The VIP Suite @ Alpine Ski Lodge / The Executive Suite @ Stark / The VIP Suite @ Tiki Palace / The Haunted Room @ Dunwich House. The 5 hotels have 10 levels each - a perfect length for the game, building up the challenge without letting ennui set in from spending too much time at one hotel. Since every hotel starts from scratch, the game-play keeps reverting to square one, so it's akin to playing 5 small games rather than a single 50-level game. No level is exceptionally challenging, and attaining Expert rank (with large margins) is simple throughout. Judicious purchase of stars for the rooms easily produces enough star bills to complete the VIP suites by the 8th level. While this reduces difficulty, it helps keep the game moving without frustrating the gamer. Flo can win upto 8 medals for milestones reached - completing each hotel, completing the game, achieving expert rank for all levels, and completing all VIP suites with all available embellishments. 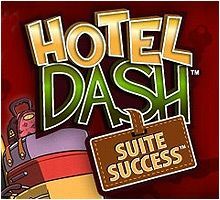 And for those who just cannot get enough of Hotel Dash: Suite Success, there is the Endless Mode, which provides additional arcade fun once the Story Mode is over. Four and a half cheers for this spiffy, back-to-the-basics game! 1. 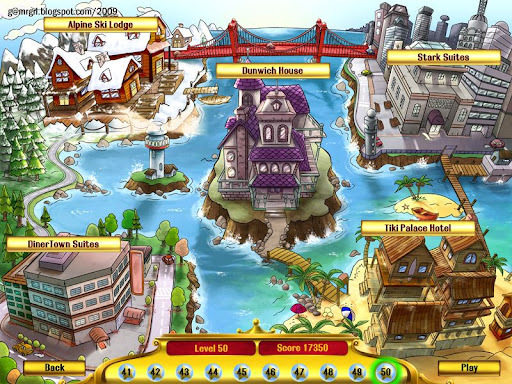 First, it's not a difficult or demanding game, even with 155 levels. 2. Tutorials take you through the production process of new products. 3. 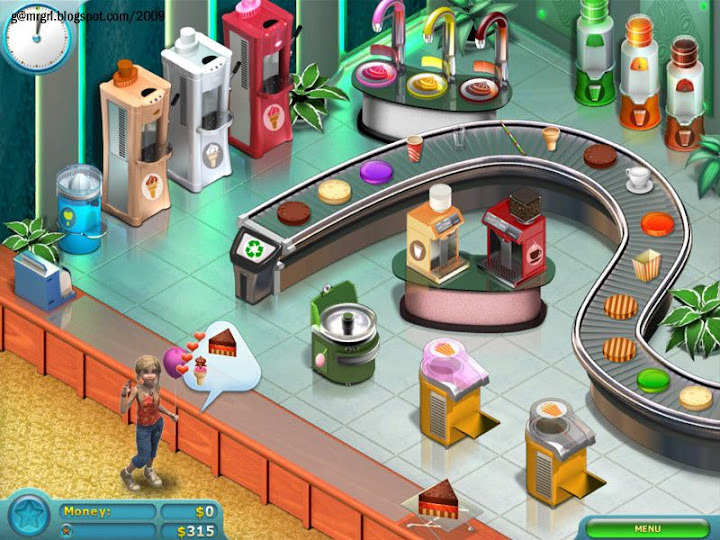 Right at the start of a level, keep all dispensers filled with one serving: soda, popcorn, candy floss, ice-cream, coffee, cappuccino (with a tall glass - see Point 9). Note: Milk, juices and milkshakes all use the clear tall glass. 4. Refill all dispensers immediately after serving. A time-saving way of doing this is to pick up the same container (e.g. a popcorn tub) from the conveyor belt and take it to the dispenser (e.g. the popcorn machine, which already has a full tub sitting in it), and replace the full tub with the empty tub. This saves an additional move to the conveyor belt, and keeps you from forgetting to refill. 5. This logic does not entirely apply to the juicer as the fruits appear only when a customer asks for a juice. However, save time by keeping a juice glass sitting in the juicer so that once the fruit arrives, you only have to pop the fruit in. 6. In case you complete a juice order using one of the 'Fulfil Order' bonuses and have a full glass sitting in the juicer, make sure you place it on the display shelf to have one of the customers order it. Otherwise when the next juice order comes, this will be wasted (no monetary penalty, only time and effort wastage). 7. Keep the ice-cream dispensers loaded with cones, not tall glasses (used for making milkshakes). Milkshakes are ordered much more rarely than ice-cream cones. 8. In case you have a full cone sitting in an ice-cream dispenser and a customer wants a milkshake of the same flavour, don't throw away the cone. Pick up a tall glass and click to exchange it with the full cone. Wait till the glass has the ice-cream, then switch the cone back. Take the milkshake glass to the blender to complete the order. 9. Similarly for the cappuccino machine, which can serve both hot milk (tall glass) and cappuccino (full coffee cup). Milk is ordered more often than cappuccino so keep a tall glass sitting in the cappuccino machine. In case someone wants cappuccino instead, pick up the full coffee cup from the coffee machine, click to switch with the milk glass, wait till the cappuccino is ready, then switch the milk glass back. 10. In the equipment selection list, always select the blender last so the time-consuming activity of making milkshakes is done for the least levels possible. The cappuccino machine should be second last. 11. The cakes do not require the three layers to be selected in any particular order. Only three correct layers have to be chosen. 12. There is a 'cake of the day' put on the display shelf from Level 2 onwards. The first or second customer always orders this. Use the time saved to set up the dispensers before rush hour starts. 14. Use the time delays between customers (more frequent than you'd expect) to build complicated cakes to put on display. 15. Since there is no overnight wastage i.e. no money is deducted for food / drinks that remain at the end of the day, or monetary penalties for throwing away wasted items, don't be afraid to keep dispensers filled and make as complex cakes as possible for display. 16. Getting gold levels require maximising tips and selling more complex cakes than the customers would order on their own. 17. Use the advantage of serving customers by right clicking the mouse button instead of dragging the item to them - it will save you time and make your mouse pad last longer. 18. Bonuses expire and cannot be accumulated, which removes strategic planning using bonuses. 19. 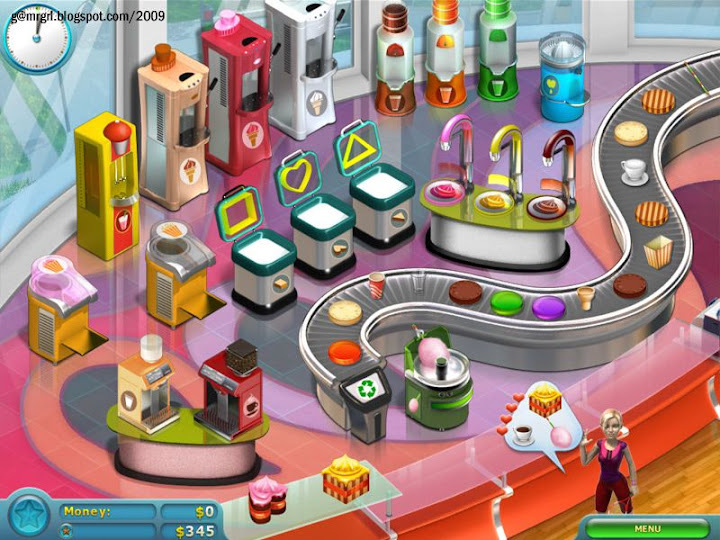 Use the 'Quicker Machines' bonus to re-stock the dispensers and build complex cakes rather than serve customers (unless they're getting really upset). 20. It doesn't matter which part of the shop under construction you choose to build at any point of time. All parts must be eventually selected to complete the shop. 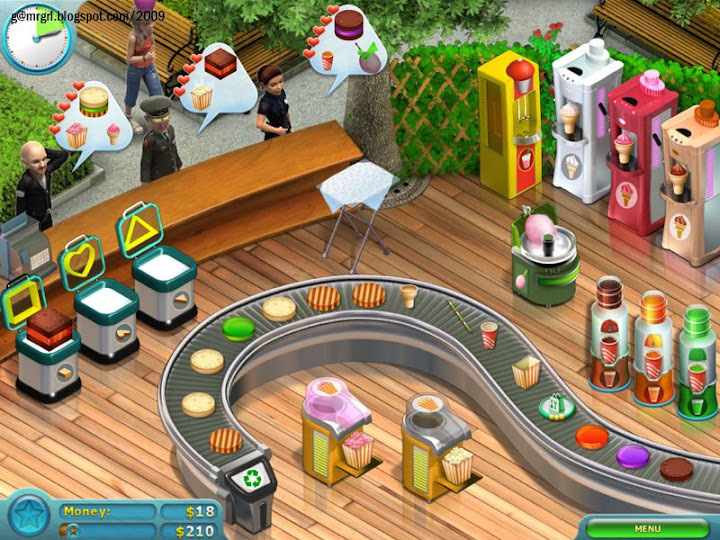 review: First, the good news: Cake Shop 2 has a whopping 155 - yes, 155 - levels stuffed with cakes, shakes, colas, coffees, popcorn and candy floss - sweet, but definitely not short! Now, the story. I haven't played Cake Shop, the original title, and so started fresh with blonde, blue-eyed heroine Emily. She takes time off from sunbathing at a resort to drop in at her friend Frederico's cafe for a chat and a coffee. Moments later, Frederico's grandma calls to inform him that she's getting married for the, uh, seventh time. Since he must be familiar with the drill by now, Frederico drops all work, including his cafe, into Emily's lap, and jets off to attend the big day. But that's not the last we see of him. Once Emily starts slogging behind the counter, Frederico reappears, dressed nattily in a striped grey suit. Suddenly, he's the boss and she's the employee. 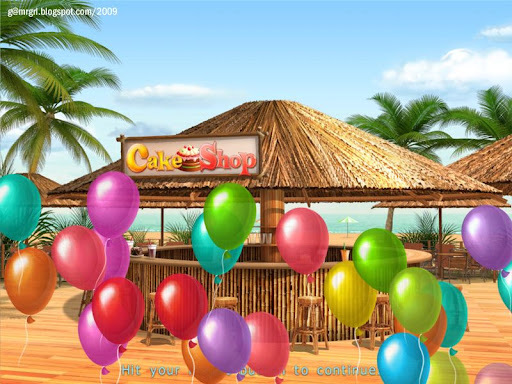 He tasks her into building his beach shack cafe into a Cake Shop conglomerate spread across the city, all the while spewing inanities such as, 'I don't know how you did it!' and 'Even I couldn't do that!'. He (generously) allows her to keep the part of the money not spent in constructing new buildings and upgrading equipment as her salary, and sends her off to a well-earned vacation at the end. What about a partnership in the firm she built for you, bro? 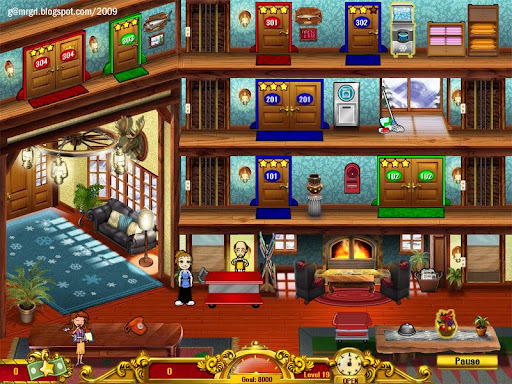 Emily, unlike the feisty heroines of other time management games like Flo and Jill Evans, remains a static image on the level loader screen. It's Frederico's show all the way, and the gamer may have actually cared about the 'big picture' if he had been the protagonist. 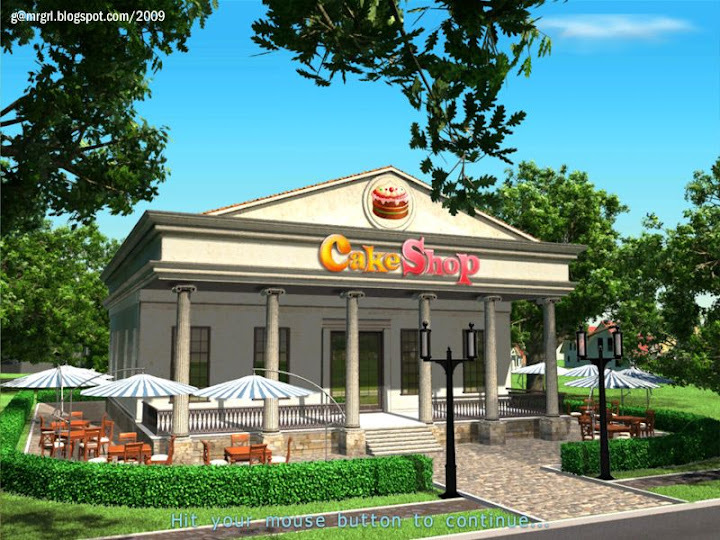 Building the Cake Shop empire is Frederico's dream, not Emily's. And thus, the story fails. Which makes this game, well, just a game. So, coming to the game-play. Cake Shop 2 follows the conveyor belt format. 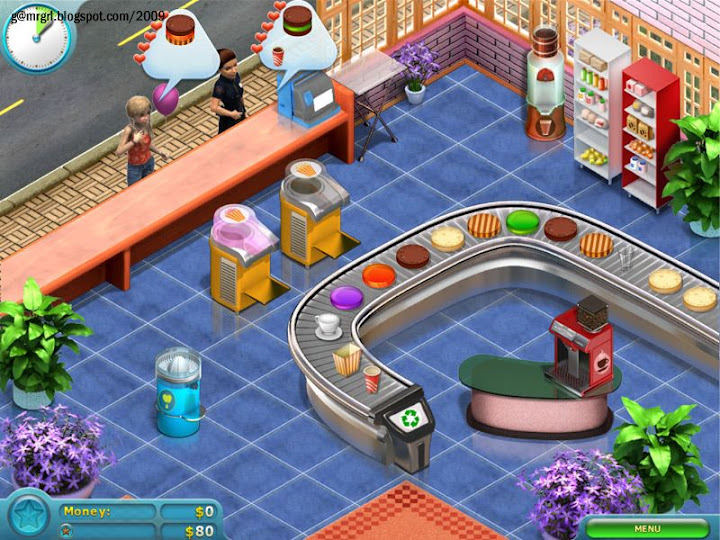 The ingredients must be plucked off the carousel and used with various equipment, purchased between levels, to serve the customers. Besides cakes, the Shop also offers sodas (cola, orange, regular), ice-cream cones and shakes (vanilla, chocolate, strawberry), popcorn (salted, caramel), coffee (normal, black, cappuccino), juice (apple, grape, orange), candy floss, and hot milk. The cakes are three-tiered - two layers of waffle sandwiching a layer of filling. The tiers appear separately on the belt and must be combined correctly to make the basic, round cake. Cakes may be shaped into squares, triangles or hearts, and may be topped with chocolate, peach or strawberry sauce. Ice-cream cones can also be topped with the sauces. Equipment includes soda and ice-cream dispensers, a blender, a juicer, a coffee maker and a cappuccino machine, popcorn machines, a candy floss spinner, cake shapers and toppings taps. 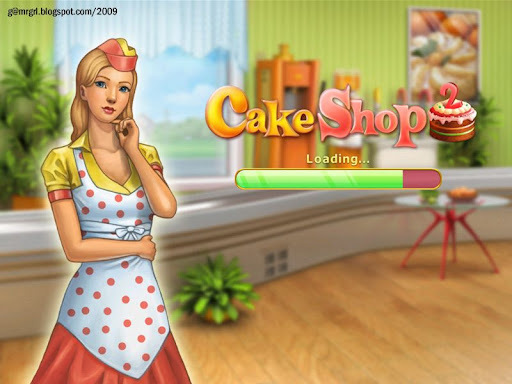 With such a vast array of products, flavours and equipment, Cake Shop 2 boasts incredible game depth. Equipment choices determine the items offered and revenue. But more expensive, complicated items need more time to make, which means less tips, so a strategic balance has to be constantly maintained between cost and time. Emily's efforts are supported by four types of bonuses. 'Patience' adds hearts to the customers; 'Time Freeze' switches the clock off for several precious seconds; 'Quicker Machines' make equipment produce items instantly; and 'Fulfil Order' completes part of an order, an entire order, or all pending orders at that moment. All bonuses can be upgraded thrice. Upgrading 'Patience', 'Time Freeze' and 'Quicker Machines' adds seconds to their time limits. 'Fulfil Order' upgrades in service range. 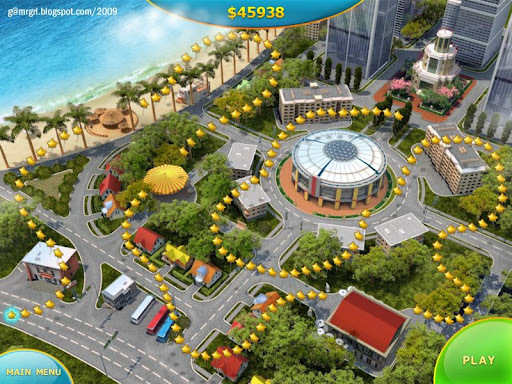 However, the bonuses expire within seconds, and it's difficult to use them to any serious strategic advantage. For example, the gamer doesn't have much control over using 'Quicker Machines' if the bonus is expiring and the customers are only ordering basic, round cakes. Or the 'Patience' bonus appearing when there are no customers around. Customer types are few and remain constant irrespective of the shops' locations. Buyers include a cop, a tennis player, a young girl with a balloon, a businessman, a tourist, and a blonde hottie who looks, waves, walks and talks on the cellphone just like Paris Hilton. 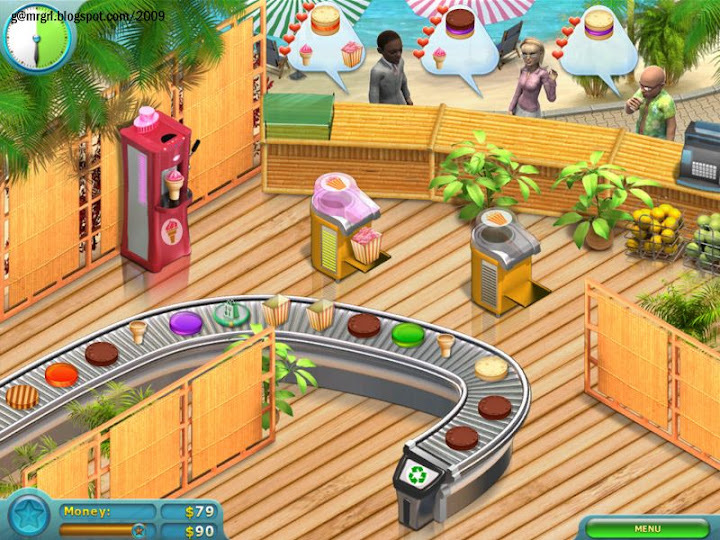 Profits are used to construct new shops - there are four (Beach Cafe, Park Cafe, Business Cafe and Central Cafe), plus an office. Construction proceeds parallel to the game, but selecting which portion to build is perfunctory - all portions have to be purchased to move to the next shop. Same goes for equipment upgrades, though in this case, buying intelligently helps save time during the initial levels. A drawback to planning equipment purchase is that product prices are not mentioned - for example, is coffee more profitable than popcorn? However, this oversight is rendered irrelevant as goals are easily achievable and profits are much higher than expenses, so there is no money crunch (I finished the game with $46,000 AFTER all expenditures). 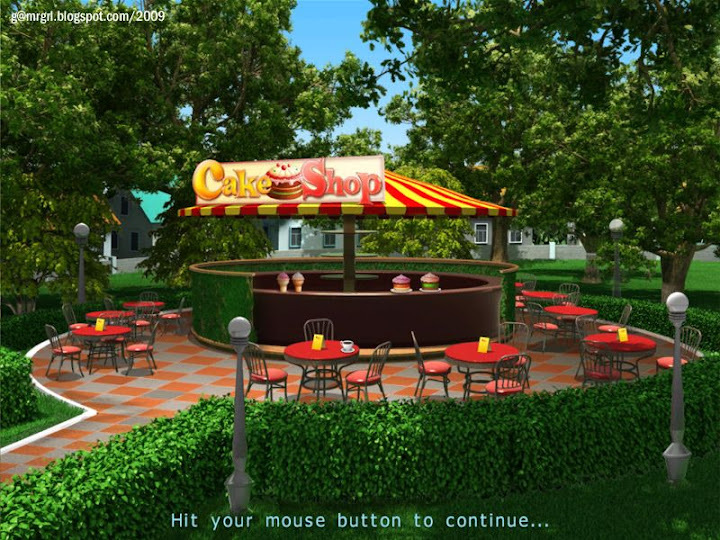 A few game design elements make Cake Shop 2 more efficient than its peers: customers can be served by clicking the right mouse button on the item rather than have to drag it to them; there is also no 'overnight wastage' - money deducted on leftover items when the shop closes, nor any penalties for discarding useless items except the time lost in handling them. Customers aggressively buy items on the display shelf, and putting up more expensive items for show pays off handsomely in managing time and effort and controlling customer flow, directly resulting in greater profits. On the downside, serving customers a part of their order does not improve their mood, so there is no way to cheer them up unless the 'Patience' bonus comes up. 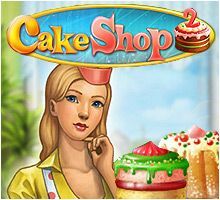 For all its game-play strengths, Cake Shop 2 has sub-par production quality by today's standards. The stylised art sequences are dull, Frederico and his assistants' lip movements are disconcerting, and the customers walk like zombies on skates. However, the equipment animation is good, and well-complimented by the sound effects. That brings up the music, which is possibly the worst part of the game. The severely limited selection comprises a couple of basic sound loops and a jarring jazz-like piece. This is one of the very few games in recent times that I played with the music muted. The text is rudimentary and suffers from poor grammar and spelling errors, possibly due to translation into English from its original language. While having so many levels prolongs playing hours, unfortunately, more than half the game is painfully sluggish. Customers appear sparingly, and huge chunks of time lie unutilised. The action picks up in the second half but only slightly; it's easy to get the gold star on every level till the last. In that, the game is often boring, if not downright tiresome. 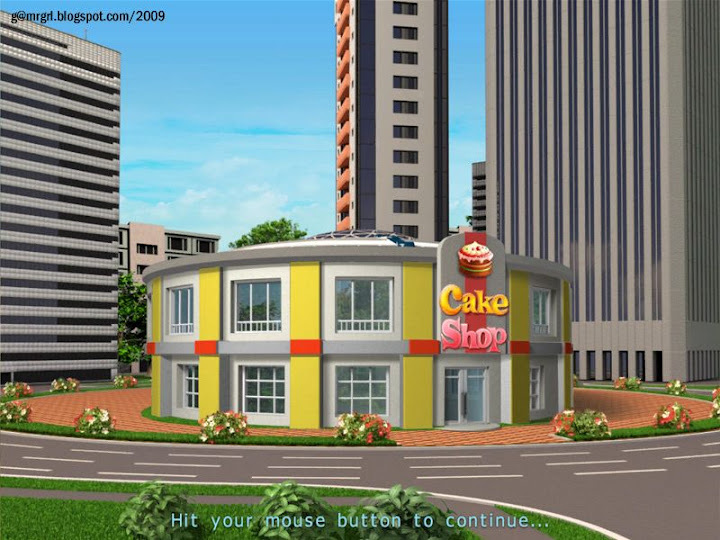 Cake Shop 2 is ambitious both in length and depth, but the two elements never blend together effectively enough to provide the adrenalin rush of racing against time while juggling multiple challenges. Nor does it create any sense of achievement once it is over, only a bit of relief. review: Edgar Allan Poe (1809 – 1849), an American writer, poet and literary critic, is most famous for his tales of mystery, horror, crime and romance. 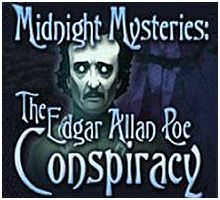 Ironically, Poe’s own life-story (Wikipedia) reads much like one of his novels, and his mysterious death, unexplained to this day, forms the basis of the hidden object adventure, Midnight Mysteries: The Edgar Allen Poe Conspiracy. Casual games rarely aspire to elaborate storylines. So to see developers MumboJumbo tackle a story as complicated and controversial as what really happened to Poe that fateful election night in Baltimore initially feels over-ambitious. The game starts in 2009 in Poe’s study. 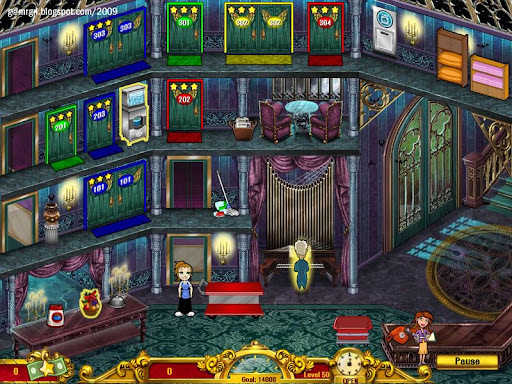 A raven (popularly considered Poe’s mascot based on his poem, ‘The Raven’) leads the player to the chained ghost of Poe, who must be set free by solving the 160-year old case of his murder. To do so, the player must use Poe’s watch to travel back in time, and unravel seemingly unrelated mysteries that eventually lead to the truth of his demise. From the Westminster Cemetery at Baltimore where Poe is buried, the player time-travels to 19th century Paris, solving the murder of perfume store employee, Marie Roget, and then to New York, solving a second, startlingly similar murder, that of cigar store girl Mary Rogers. This segment is based on Poe’s tale, ‘The Mystery of Marie Rogêt’, but certain characters are taken out of the story and set into the ‘real’ scenario of Poe’s life – and death. From New York, the player, at Poe’s behest, travels to Sullivan's Island in South Carolina to recover pirate Captain Kidd’s treasure. Based on another famous Poe story, ‘The Gold-Bug’, this segment is short, and feels irrelevant until the very end, when it reveals the modus operandi of Poe’s murder. Using a train ticket found on Sullivan's Island as a lead, the player then travels to Baltimore, retracing the events that led to an injured Poe being found, dressed in a stranger’s clothes, in a lane beside Gunner’s Hall on the night of the elections. Poe is taken to the hospital, where he dies, but the investigation soon exposes the real culprits and their motives. Finally, poetic justice is served, along the lines of ‘The Pit and the Pendulum’ and ‘The Masque of Red Death’. Poe is free of his chains once more, and the player is richer by about $15 million, part of the pirate treasure. The game has a conceptual time limit of 24 hours for the resolution of the mystery; however this does not translate into any game-play component. The hidden object hunts are not timed either. The screens are neat and attractive, and some, like Poe’s grave at Westminster, are drawn in realistic detail. Animation is sparse and average by today’s standards. The object cliparts are ordinary, but relevant to the era and scenario they are set in. 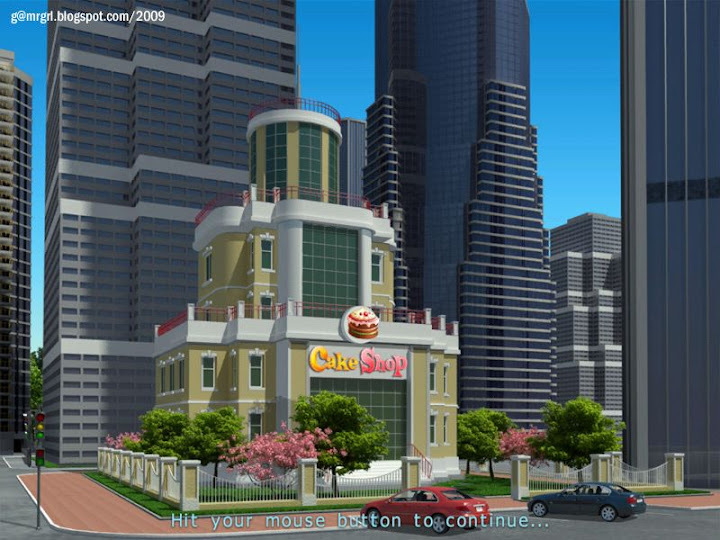 Some of the hidden objects are present on-screen, while the rest must by ‘exposed’ by using objects that have already been located and stored in a toolbox. Extra ravens can be collected to serve as hints, but given the uncluttered screens, few are essential. A few brainteasers - match items, jigsaws and logical puzzles - are scattered through the game; none are unduly complex, and all are aligned with the plot. The other high point of the game, besides the story, is its music. Composed mainly of piano and violins, the scores are haunting and melancholy, and occasionally, scary. They effortlessly build ambience, and along with spooky sound effects, add significantly to the experience. The research is remarkably in-depth. The story integrates Poe’s real life and literary works seamlessly into a tight new adventure. Well-known protagonists, both real (physician Dr. Moran, literary rival Rufus Griswold, fiancée Elmira Royster, politician Boss Tweed) and fictitious (Inspector Dupin, William Legrand) populate the narrative. Several peculiar events related to Poe find place in the game – the legend of ‘The Toaster’ who leaves a bottle of cognac and three red roses on Poe’s grave on his birth anniversary every year; Poe’s efforts to secure funding for his journal ‘The Stylus’; the fact that he is said to have repeatedly called out the name ‘Reynolds’ before he died; and rumours that he may have been a victim of ‘cooping’ - illegal confine-ment linked to election fraud, depicted in the film, ‘The Death of Poe’. Multiple reference points blur the lines between reality and fiction, and create an alternate universe that is an amalgamation of both. This is both good and bad – it gives the plot tremendous depth, but also leads to massive confusion of names, places and events for the average gamer who’s just not that into Poe. It often feels like much is going on that doesn’t link to anything that came before; this sort of head-scratching can turn off casual gamers who are consciously looking to take it easy. On the other hand, the game can intrigue players, like it did me, to retrospectively delve more into the baffling history. I was fascinated by the effort of the developers to write the story using inputs from numerous, often contradictory, sources, close all loopholes, and take it to a conclusion that is lucid and satisfying. On cross-referencing Wikipedia and the game, many of the finer nuances became relevant, creating some ‘ah’ moments; it also set me wondering how much more I’d have enjoyed the game if I truly knew Poe’s life and works in depth. Midnight Mysteries: The Edgar Allen Poe Conspiracy is a fitting tribute to one of the world’s greatest writers on his 200th birth anniversary. Highly recommended for those looking for a robust story in a casual game.